Neath is a classic James Braid design taking advantage of the natural landscape to create a superb golfing challenge. The heathland course incorporates trees, heather, gorse, dry stone walls and fine undulating greens to test every asset a player has. The turf is perfect for a golf course offering firm fairways and greens. The finest of all heathland courses in South Wales, it offers a stern challenge from the championship tees. The record is 64 set by Daniel Davies in 2013. The previous course record stood for 20 years a 66 by A.L.Cooper in 1993. From the standard tees it offers golfers of all standards the opportunity of playing a truly great course with dramatic panorama of the surrounding mountains and coastline. Gradually climbing away from the clubhouse this par 5 offers a classic risk and reward strategy. 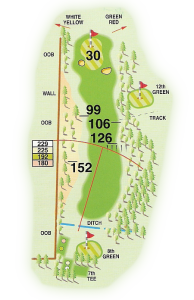 A generous fairway with room to the right, the ideal line is the left hand side of the fairway which brings the out of bounds into play which runs down the left hand side. A dry stone wall gives players pause for thought on the second shot with the wall slanting across the fairway making distance perception difficult. 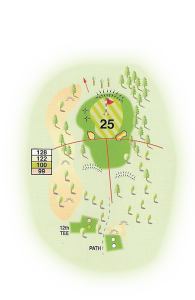 The green is defended by two greenside bunkers each side of the front of the green making the safe option the back of the green, but leaving a tricky downhill putt on a green sloping from back to front. A deceptive opening hole that can be more dangerous than it looks. 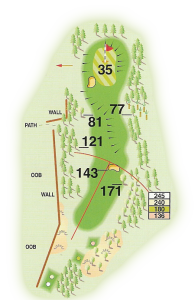 A unique hole which takes play from the bottom plateau to the top plateau of the course. 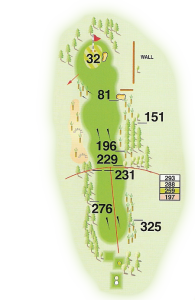 A blind par 3 in which club selection is paramount with the wind playing a major role which sometimes swirls against the hillside. 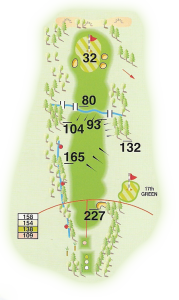 With no bunkers the green itself is the main defence with a large slope right to left making the left hand side of the green the preferred target. Anything landing to the right of the green makes it difficult to get up and down. Often called "The Bell Hole" due to the old ships bell that came from a shipbreaker in Briton Ferry that used to be used to inform players on the tee that the green was clear. The bell now resides in the clubhouse and the Neath Bell, an annual Glamorgan Order of Merit tournament, is played for. This hole offers players their first superb panoramic view over Neath, Port Talbot all the way down to Mumbles Head. The original "Braid Tee" was recently found and reintroduced as the championship tee adding 88 yards to the hole and making this one of the hardest tee shots on the course. The hole plays totally differently from the Championship tee making it one of the most interesting holes. 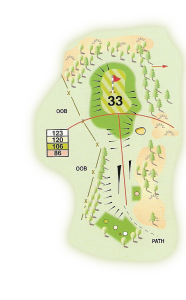 A dog-leg right with a stream running across the fairway just past the corner and trees on both sides, strategy plays an enourmous role getting the correct position to be able to attack a slightly raised and well defended green. 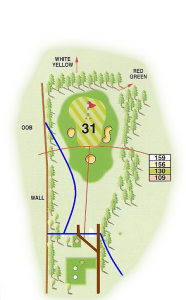 Excluding the championship tee long hitters have the option of laying up to the dog-leg or risk cutting the corner carrying the stream to land on the approach to the green. A par 5 with out of bounds running the entire left hand side and behind the green. The tee shot attacks the fairway from an angle landing into a generous lightly sloping fairway. The only real danger is a fairway bunker on the right hand side ready to catch a poorly struck drive. The placement of the second shot is crucial to be able to attack the pin on the right to left sloping green. The excellent design offers players hitting from the left hand side of the fairway, closer to the out of bounds, the best angle. Par is a good score for anyone approaching from the right hand side. A good chance to pick up a shot if played correctly. A superb par 3 that would not look out of place on any course. The green sits perfectly in a slight bowl with a back drop of pine trees. Three bunkers protect the front of the green which is fairly narrow and widens towards the back. The hole entices the player to play safe to the back of the green, however this is not the safe option with a severely sloping green from back to front. Club selection and tee shot placement are vital on this deliciously tricky little hole. A superb design making the player think about how to play the hole. Interestingly this is the only hole on the course with a bunker directly in front of the green, all the other holes offer the player the option to pitch short and run on, but not this little beauty. 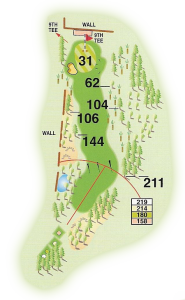 A short par 4 that plays downhill with a left to right sloping fairway that gathers short drives into a fairway bunker. The approach is tricky with distance perception difficult to judge. The green is tucked into the bottom of a slope with a superb vista in the background. 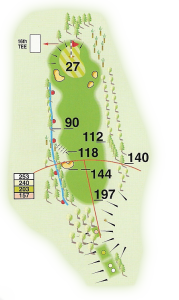 Longer hitters can get close to the green but a ridge running half way across the green, anything short and right will be collected by a swale and run off the green. Distance and spin control on the approach are paramount. A birdie opportunity if the hole is played correctly. Playing downhill from a tee overlooking the course and superb vista the wind plays a large factor on both the tee shot and approach. Hitting the fairway is crucial to be able to maximise control on the approach to a green that slopes away from the player. The tee shot lets the player see all of the danger with a wall to the left and heather to the right which will catch a short sliced drive. A burn runs across the fairway 80 yards in front of the green which is protected by a bunker each side, with the left bunker being dangerously deep. A difficult hole especially in the wind. One of the toughest par 4's in Wales. A dogleg left on a gradual incline from tee to green. The generous fairway must be hit to avoid gorse and heather and to give players a chance to reach the green in regulation. 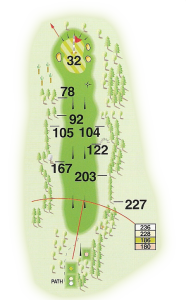 The green itself is the main defence on the hole with a severve slope from back right to front left. The approach needs to finish below the hole to offer the easiest putt, but the solitary bunker comes into play being front left of the green. A classic par 4 that would not look out of place on any championship course. A short par 4 that can offer a birdie opportunity. The fairway is fairly generous but thick heather encroaches from the left and out of bounds awaits a wayward tee shot left. The difficulty of the hole is distance perception on the approach. Even though the appraoch is generally from a fairly short distance the green is slighty raised from the fairway with no backdrop except open sky. 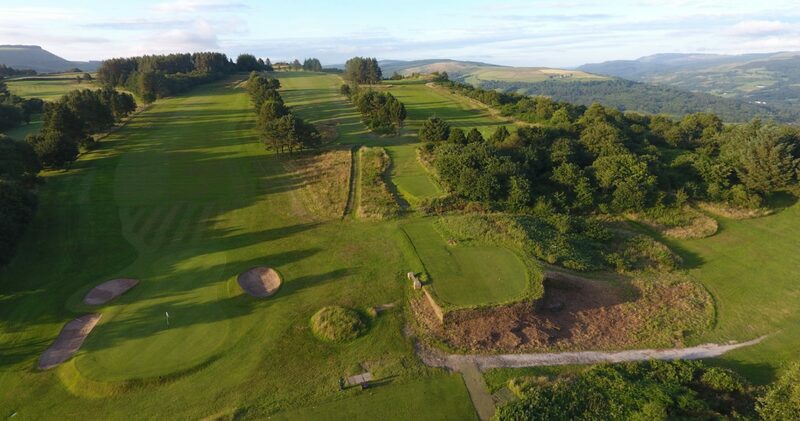 One of the signature holes on the course sitting on the edge of the plateua offering inspiring views over the Brecon Beacons and down the Neath Valley. A semi blind tee shot requires the correct line to be chosen to hit a fairly generous fairway with some heather on both sides. The fairway narrows as it approaches the green with trees and a rocky outcrop funnelling the hole into a narrow green. The green is protected by four bunkers, 3 on the right, and has a ridge running across the green creating a classic two teired green with the front tier being higher. 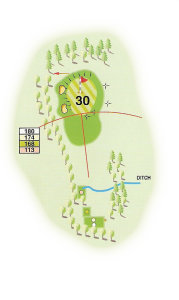 The back of the green offers the safest target and the easiest pin position is at the back of the green. A short downhill par 4 that plays down the edge of the plateau ofering a chance for a good score. The only fatal danger off the tee is on the left of a generus fairway. The fairway bunker is positioned to catch only very short right drives and rarely comes into play. The green runs away from the player on the approach which can make distance judgement tricky but the ball can be landed short to run into the green which can sometimes be the best option. Downwind long hitters can reach the approach or green itself from the drive offering a good birdie opportunity. 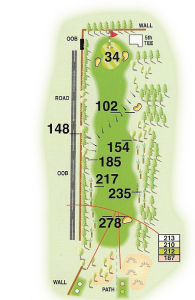 An uphill par 5 that plays longer than its yardage. The generous fairway slopes slightly right to left and is protected by trees both sides. A fairway bunker on the right hand side is the only real danger before the green which is over a slight brow. The green itself is fairly undulating proving the main defence with a solitary bunker of the right for protection. 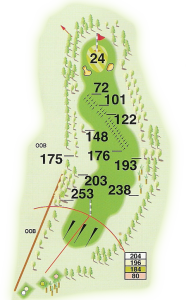 A classic par 5 that does not hide any danger from the player and if played well can offer a good score. Probably the most inspiring hole on the course offering the player the opportunity to hit a good drive arcing against blue sky (yes even in Wales sometimes) with a superb panoramic vista in the distance to a fairway that runs downhill all the way to the green. The vista hides one of the most formidable holes on the course. The player can see all of the danger from the tee being the trees both sides of the fairway. 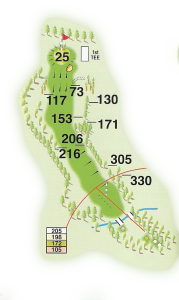 The approach is very difficult playing from a slightly downhill lie to a green that slopes away from the player. The green is narrow with two bunkers on the right and one on the left midway on the green narrowing the green at this point. Not a hole to be taken lightly with the wind adding another factor of difficulty. 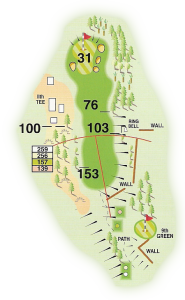 A delightful little par 3 that is the shortest hole on the course and one of the easiest. Set naturally in a slight bowl with a rock outcrop on the right protecting the green from the prevailing wind the green is protected by two bunkers at the front and a couple of mounds on the left. Certainly an opportunity to pick up a shot with the flattest green on the course, the only real defense is distance perception with a far reaching view behind the green from the tee. "The Pulpit" is one of the most famous holes in Wales. A spectacular hole that takes the course from the top plateau to the bottom plateau 80 feet below in one shot. The tee is set on the side of a rock outcrop with the tee shot being hit into pure sky. The Ladies tee is set on top of the rock outcrop where the fairway can be seen and the view one to definitely see. 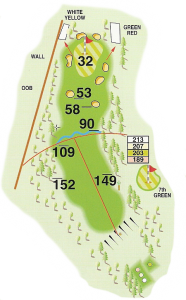 Once the player has recovered from the spectacular drive and looks at the approach they will find a short par 4 that offers a birdie opportunity if played well but has danger to the left with a leat running the length of the fairway and a well protected green. The wind is the holes natural defence and a green that slopes away from the player. A rare hole to be enjoyed that James Braid must have been proud of. A deceptive par 4 that plays difficult for its length. The fairway rises away from the tee to a brow before a flat approach to the green. Accuracy off the tee is paramount to give the player the best lie and line into one of the most difficult greens on the course. A brook runs across the fairway 80 yards before the green ready to catch players who are recovering from a poor drive. The green is well protected at the front by three bunkers and the front of the green slopes severely catching anything short and running it off the putting surface. The rest of the green slopes from left to right making the ideal target the right side of the green. Distance and spin control have to be controlled on the approach to gain good position on the green. Classic strategic design making the player think about how to play the hole. 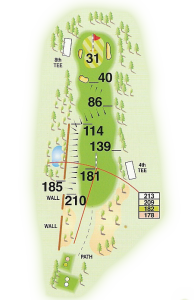 The longest par 3 on the course but the player has the opportunity to run the ball onto the green. The green is defended by two bunkers on the left over which there are trees and grass mounds on the right. The clever design makes the right hand side the safe option from the tee, however this gives a tricky chip or pitch to a green that slopes from right to left. The ideal finishing position from the tee is the left hand side of the green but this brings the danger into play. 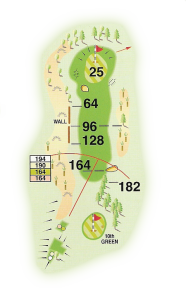 A demanding par 3 near the finish which makes the player think about the best way to play the hole. The finishing hole can make or break a good score. The longest hole on the course that is a gradual dog leg from left to right with an adverse camber. Hitting the correct line from the tee is crucial to gain the most run and trees left and right await the wild tee shot. 120 yards from the green the narrowing fairway drops down to the green with the camber increasing kicking short approaches to the left which will miss the green. This camber makes the player hit to the right where a bunker awaits those too far right making accuracy on the approach crucial. A classic finishing hole that can offer a birdie if played well with one of the flatest greens on the course. However a danger to players trying to gamble and force a good score.